The meat itself is often cut in the L.A. rib style, which is basically a rack of ribs cut in thin slices across the bones. This makes eating galbi easier with chopsticks or with fingers. 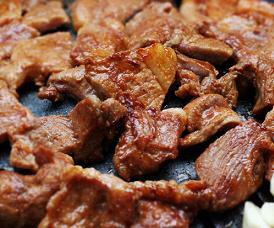 Galbi is usually available in most Korean restaurants but it is generally served in venues that specialize in galbi and the meat is cooked on an in-table BBQ.